I would be remiss if I did not write about the worst drug that society faces today. It is my experienced and professional opinion that crystal methamphetamine will lead to huge physiological and physical problems. I have witnessed this drug directly attribute to violence, homicide, suicide, homelessness, psychosis and physical breakdown. Death will usually occur if treatment is not sought. The user will become addicted quicker than most drugs and crystal methamphetamine will be devastating to the addict and to those around him or her. Methamphetamine is a stimulant to the central nervous system. It releases huge amounts of dopamine from the brain to produce an euphoric feeling. – Compulsive behavior, I have seen people take apart their weedwacker in the garage at 3:00 in the morning. Over and over again. – Sweats, People will often strip off their clothes in public if it becomes to hot for them. You may have noticed that it takes a signature to purchase your allergy medicines these days. The reason is that Methamphetamine cookers need Ephedrine and Pseudo-ephedrine to make crystal. These are call precursor chemicals, they are used in the manufacturing of crystal meth. The manufacturing of crystal methamphetamine is so dangerous, these clandestine laboratories are a hazardous chemical dump and when found, law enforcement must use chemical suits and respiratory equipment similar to a scuba. These laboratories are considered to be a hazard waste site and will be contaminated for years if not cleaned properly by professional environmental agencies. These clandestine laboratories should be of great concern for any town or city. Crystal Methamphetamine does kill and we need to stay vigilant, never stopping to educate ourselves on the risks that pose harmful dangers to our children. Do not let our children learn from the drug dealers on the streets, or succumb to peer pressure in their schools and neighborhoods. If its not up to us then who? Be a parent, stay informed. If there are certain things that parents have asked about drugs and their kids, it’s “what does this mean? ” “What does it look like?” “What should I look for?” All very common and not at all unique. Most parents don’t have any idea of the vast variety of drugs that are available to our children. The days of smelling the odor of marijuana or alcohol are the days of old. Our children have many more options for mind altering substances today. They are readily accessible and have been marketed by the dealers with very attractive names and packaging for young adults and children. I hope to be able to give a little insight into identifying popular drugs that are being abused today. This is not easy for parents because there are so many different types of abused drugs. Through this blog, I will try to help you identity prescription drugs, illegal drugs and drug paraphernalia. This week’s topic is on Ecstasy aka MDMA. 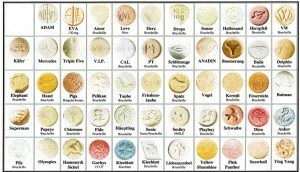 Street Names: Beans, Eve, X, XTC, STP, Peace, Lover’s Speed, E. MOLLY is a name used for the pure powder or crystalline version of MDMA. MOLLY is short for Molecule because it is pure and does not contain any additives like caffeine or or methamphetamine, or LSD. How it is introduced to the body: Orally, crushed up and snorted, sometimes smoked. Different terminology used for dosages are, piggy-backing (taking doses throughout a period of time), Stacking (taking 3-4 pills at once), Candy flipping is when you take MDMA and LSD together to get the effect of the hallucinogen with the mellow effect of the MDMA. Physiological Effects: MDMA affects the serotonin in the brain. Serotonin is used by the body to regulate mood, anger, aggression, sexual activity, sleep, and pain detection. MDMA increases the need for pleasure and stimulation. The person needs to be touched and held, and is very sensitive to touch. Physical Effects: MDMA will create the same health risks in a person as other stimulants: increased heart rate, higher blood pressure, tremors, teeth clenching, nausea, chills, sweating, muscle cramps and blurred vision. A person taking MDMA can suffer from hyperthermia (sharp increase in body temperature). This can lead to kidney, liver, and or cardiovascular failure. Being able to identify the dangerous drugs available within our communities gives parents knowledge that can be used to help educate and protect our children. Hello concerned citizens, parents and child care providers, I guess by now you have heard of Bath Salts. If you have not, you need to read this blog. If you have, you need to read this blog. Throughout my years in Law Enforcement, street drugs have always been marketed to the user in a nice, picture perfect way. Chemists have tried to change the molecular structure to get around the laws that prohibit the drug that is currently being used or sold. Can you imagine that some of these chemists (cookers) did not even graduate high school? Recipes are passed down from cooker to cooker and are widely available on the internet. Bath Salts are synthetic stimulants that are found in retail products. The stimulants are chemicals that are sold on the internet, in stores, and in head shops. Street Names: Bliss, Blue Silk, Cloud Nine, Drone, Energy-1, White Dove, White Lightning, Snow Leopard, Stardust. Looks Like: Bath Salts are sold in powder form in small plastic or foil packages of around 200 and 500 mg.
Methods of Use: Bath Salts are usually ingested by sniffing/snorting. They can be taken orally, smoked, or put into a solution and injected into veins. Physiological Affect: People who abuse these substances have reported agitation, insomnia, irritability, dizziness, depression, paranoia, delusions, suicidal thoughts, seizures, and panic attacks. Users have also reported effects including impaired perception of reality, reduced motor control and decreased ability to think clearly. Physical Affects: Bath Salts act as a central nervous system stimulant and cause rapid heart rate (which may lead to heart attacks and strokes), chest pains, nose bleeds, sweating, nausea, and vomiting. Overdose Effects: These substances are usually marketed with the warning “not intended for human consumption.” Any time that users put uncontrolled or unregulated substances into their bodies, the effects are unknown and can be dangerous and deadly. Bath Salts and it composite chemicals are illegal in Maine. Governor Legpage signed into law on 4-2-2012 a bill strengthening laws against bath salts. There are at least 41 states that make Bath Salts and its compounds illegal, with other states pending legislation. In July 2012, President Obama signed a bill that amended the Federal drug policy to ban Bath Salts. Until the other states have their laws pass, the Federal Law will take precedent. Please take a few moments to watch the video. A friend and former co-worker from Mesa Police Department. Sgt. Landato, along with the City of Mesa’s Chemist talk about Spice and Bath Salts. It contains valuable information. How Do Bath Salts Get Into Maine? I want to welcome you to the first of many topics discussed in “Not On My Watch.” This blog is for you. It’s about keeping our kids safe from the dangers that exist in the world today. These dangers change daily and we must be diligent in keeping up with them. Believe me, If we don’t someone else will and that person may be your child. This is a brief history of the synthetic drug. John W Huffman is an organic chemist and was asked to synthesize (make) a drug that would have the same effects on the brain as THC. THC is the chemical in marijuana that creates the High effect. Huffman created several chemical compounds that have similar pharmacology as THC. This study was then scratched but the chemistry still existed. Like any other too good to be true drug, it was duplicated outside the laboratory and is now found all over the world. These chemicals bear the initials of John W Huffman. JWH-018 and others are mentioned in the next paragraph. K2 or “Spice” is a mixture of herbs and spices that is typically sprayed with a synthetic compound chemically similar to THC, the psychoactive ingredients in marijuana. The chemical compounds typically include HU-210, HU-211, JWH-018, and JWH-073. K2 is commonly purchased in head shops, tobacco shops, various retail outlets and over the Internet. It is often marketed as incense or “fake weed.” Purchasing over the Internet can be dangerous because it is not usually known where the products come from or what amount of chemical is on the organic material. Looks like: K2 is typically sold in small, silvery plastic bags of dried leaves and marketed as incense that can be smoked. It is said to resemble potpourri. Methods of abuse: K2 products are usually smoked in joints or pipes, but some users make it into a tea. Affect on mind: Psychological effects are similar to those of marijuana and include paranoia, panic attacks and giddiness. Affect on body: Physiological effects of K2 include increased heart rate and increase of blood pressure. It appears to be stored in the body for long periods of time and therefore the long-term effects on humans are not fully known. Drugs causing similar effects: Marijuana, Methamphetamine and LSD. Because the chemicals are changing constantly, every time it is used could create a different effect. Overdose effects: Emergency room physicians report that individuals that use these types of products experience serious side effects which include: convulsions anxiety attacks, dangerously elevated heart rates, increased blood pressure, vomiting and disorientation. Young people are being harmed when they smoke these dangerous “fake pot” products and wrongly equate the products “legal” availability with being safe. Parents and community leaders look to us to help them protect their kids, and we will not let them down. Our action, along with the community will reduce the number of young people being seen in hospital emergency rooms after ingesting these synthetic chemicals to get high. If you would like to comment or have questions regarding any topic featured in “Not On My Watch”, please email michaelm.keepingkidssafeus@gmail.com. Please be advised that all or part of your comment or question may be reposted on www.keepingkidssafe.us. Thank you. The debate of gun control has been a hot topic in the media for years. Since the tragic event at Sandy Hook Elementary School in CT, the topic of gun control has been in the forefront every night in the media. But, we are forgetting the most important issue and that is the safety of our children while they are in school. Our representatives have been arguing this issue since the tragedy at Columbine High School 13 years ago. I sent this letter to our governor, senators, Congress representatives, Vice President Biden and President Obama. Rrepresentative Chellie Pingree contacted me and would like to sit down with me to discuss these steps. We need to get this message out to the public and we need your help from the media. I appreciate you taking the time and reading this proposal. The recent tragedy on December 14 at the Sandy Hook Elementary School has not only shocked the country, but has also opened our eyes to the seriousness of many intense political, legal, and social topics that our communities must become more involved in. However, if we want to prevent atrocities like this from happening, we must begin with local changes. It is for the concern and safety of us all, especially our children, who are the embodiment of our nation’s future. As a society, if we don’t start to implement changes, and become more serious about our children’s protection, these issues will only get worse. To begin, as the founder and CEO of Keeping Kids Safe, I have put together some thoughts for bolstering protection within our schools. I am saddened and appalled over the loss of the children and educators last week. Therefore, Keeping Kids Safe wants to recommend steps to aid in the pursuit of something that is imperative and meaningful to myself, the safety of our children! I have begun by asking children and family-friends at the high school and middle age level if they would feel safer in their schools with my recommended steps in place. Every one of these children have been in complete agreement and have thoroughly liked these ideas. Furthermore, following this horrific event, I have started thinking of ways that Keeping Kids Safe could step outside of our regular safety programs, in order to try and implement these programs within our community. This will need the help of both grass-roots programs and legislature, as well as the help from parents and the communities in which we live. 1.) All Schools should have a police officer signed specifically to that school, in hopes that this officer would oversee school functions; teach classes on self-awareness issues and every day issues like drug and alcohol abuse awareness, etc. 2.) All Schools should have a rapid response team made up of teachers and or faculty members with the police officer acting as a team leader. Furthermore, they should be trained in tactics of self-defense and protection of others. 3.) All schools should train at least 2 to 3 times every 3 to 4 months. Repetition will create instinct. Instinct will create survival!! 4.) The Rapid Response Team should be trained in the use of non-lethal weapons like bean-bag guns, pepper-spray guns, as well as other inhibitory weapons. 5.) The School should install bullet proof doors, both entering the school, and for all the classrooms. 6.) All class room doors should be locked from the inside, and only opened for class exchange. Therefore, if a child needs to use the bathroom, they may leave, but must use a buzzer to get back into the classroom. 7.) There should be a badge system for faculty to enter the school. 8.) All building entrances and exits should be set up for the freedom to leave. However for reentry everyone must use the main lobby entrance by either buzzer or ID badge and go through metal detectors. 9.) The front lobby should be made of bullet proof glass and doors, since this is the only way to enter the school. When the children are changing classes NO one is allowed to enter the building, until the classroom doors are shut and locked. 10.) All first floor windows should be bullet proof. 11.) There should be cameras in the hallways, classrooms, around the circumference of the School, including parking lots. 12.) There should always be someone watching these monitors, as well as recording while school is in session. This will aid in diminishing the use of drugs, graffiti, bullying, and school break-ins. Furthermore, I have also spoken with numerous parents and local State Representatives, asking them what they think of these procedures. Every one of them agree with these procedures, and look forward to helping fund this project, in order to keep our schools safe. President Obama, please give myself, and our local representative Mark Dion, a chance to sit down with you and your staff, in order to join together as one team endeavoring to keep our children safe.